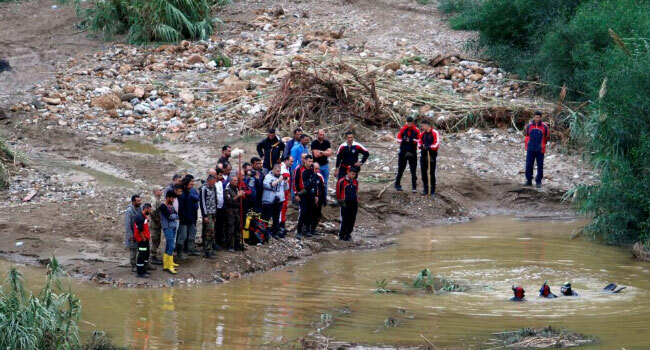 At least three people were killed in flooding of the Kyrenia region of northern Cyprus as heavy rains lashed the Mediterranean island, local officials said Thursday. Tufan Erhurman, prime minister of breakaway northern Cyprus, visited the Ciklos and Dogankoy areas where the three, including an 18-year-old woman, were killed in flash flooding that swept away cars. “We regrettably lost three people… The search goes on for one other person,” Erhurman told reporters after the bodies were recovered from river beds. Swathes of Cyprus, divided since Turkey invaded its northern third in 1974 after a coup in Nicosia backed by the junta then ruling Greece, have been hit by storms this week. Greek Cypriot authorities in the south declared a “yellow alert” weather warning on Thursday after the torrential rains and hailstorms that have pounded the holiday island. The storms have caused floods, power cuts and traffic chaos as well as damage to property and crops, but no serious injuries have been reported in the south. The extreme weather is expected to ease by Sunday.